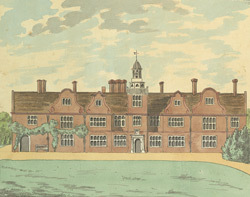 View of Rothamsted Manor House in Hertfordshire. The oldest part of the house dates from the 13th century and however it was during the 16th century that the timber framed house was encased in brick and extended by the Bardolph family who owned the estate. Sir John Wittewronge was responsible for further alterations between 1639 and 1680. He created the curvilinear gables, the clock tower and the chimneys which give the house its Jacobean look. Descendants of the Wittewronges remained in the house until 1763 when it passed by female descent into the Bennett family, and then to the Bennett-Lawes. In 1931 the house was sold to the Rothamsted Experimental station and it was converted it into a hall of residence.